Today was the 36th anniversary of the 1979 Iranian revolution. 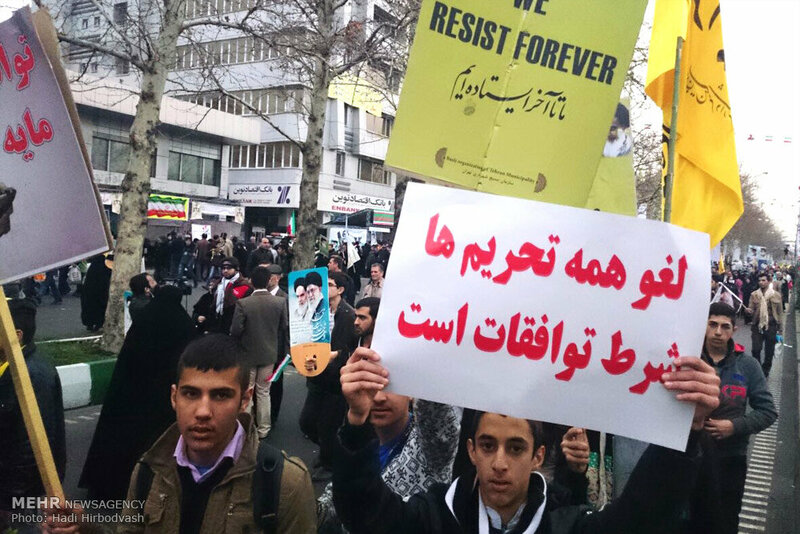 There were demonstrations all over Iran. People carried placards which were given to them. Some placards are the usual: like “death to Israel” or “death to America” or as the late founder of revolution Ayatollah Khomeini said “America can’t do a damn thing”. But others are specific, depending on what message the regime or the government want to convey to the outside world. And there are two messages which I saw today which stood out. One which called for economic resistance, and another which stated: “an agreement is conditional upon the elimination of all sanctions” (see above). Iran supreme leader also brought up this point, not once, but twice during his speech on the 8th of February. This is the same speech in which he hinted that Iran would be willing to accept a fair deal. What I find interesting is that there is no talk from Iran regarding the number of centrifuges (unless I missed it). Does this mean that the two sides have reached an agreement over this issue already? is this why so much emphasis is being placed on Iran’s demand that in case of a deal, all sanctions have to be removed at the first stage, and not gradually as the US has demanded? I can’t answer this question, because we know very little from what is going on in the negotiation room. But, I think we should note it. It seems that if the nuclear talks breakdown, judging by the recent reaction from Iran, especially from Ayatollah Khamenei and today’s demonstrations, the question of how quickly sanctions are lifted in case of a deal could be one of the major reasons.